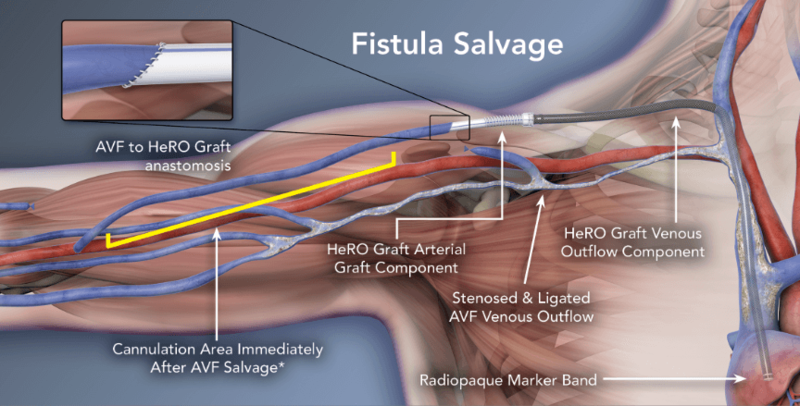 Dr. Jeffrey H. Lawson discusses using the HeRO Graft to reconstruct and salvage a patient’s fistula or AV graft venous outflow that is failing. HeRO (Hemodialysis Reliable Outflow) Graft is a fully subcutaneous solution used to salvage a failing fistula or AV graft by bypassing central venous stenosis. If you answer yes to any of the questions below, consider referring your patient for a central bilateral venogram for assessment of central venous stenosis. Is the patient failing an AVF or AVG? Is the measured Kt/V less than 1.4? Has the flow rate dropped >20%? Does the patient have swollen arms and/or distended collateral veins? 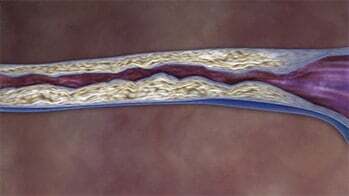 Fig 1: A fistula with venous outflow stenosis that is approaching an occlusion. A patient who has central venous stenosis and collateral veins that are distended. Typically, a short segment of the ePTFE portion of HeRO Graft is anastomosed to an arteriovenous fistula (AVF) or arteriovenous graft (AVG). One advantage of this method, if the existing AVF is matured or AVG is incorporated, is that the access can be immediately cannulated. This eliminates the need for a bridging catheter. The benefit of not needing a bridging dialysis catheter is avoiding its associated risks for infection. *If AVF is matured or AVG is incorporated. Follow your dialysis facility protocol for care and cannulation. Chen G, et al. EJVES Extra. 2011; 22(4):e37-39. Case report of patient with functioning AVF who developed arm edema due to occluded central venous system refractory to repeated endovascular treatment including two stent placements over two years. Arm swelling resolved and AVF could be used immediately after being connected to HeRO Graft. Remained functional 6 months later and no re-interventions were required. Bowers V, et al. VASA; 2010 Las Vegas, NV. J Vasc Access, 2010;11(S2):S26-27. Lin J, et al. ASDIN; 2010 Orlando, FL. Case report of two patients who had HeRO Graft to salvage failing AVF due to central venous stenosis. The HeRO Graft implants avoided the need for use of bridging catheters. Also highlighted value of collaborative team effort, credited IDT approach with timely communication resulting in saving an AVF. Gage S, et al. Ann Vasc Surg 2011; 25(3):387.e1-5. Case report of two patients with arm edema due to occluded central venous system: one with functioning AVF, one with functioning AVG. Both patients underwent multiple interventions, including angioplasty and stenting, yet symptoms recurred. Rather than abandoning functioning vascular access, the HeRO Graft was implanted which resolved the patients arm edema and saved the access. HeRO Graft has continued to function for twenty-one (21) months. Allan B, et al. J Vasc Surg 2012; 56(4):1127-1129. Two case studies describing use of HeRO Graft to salvage failing AVG and AVF due to occluded subclavian vein and failed attempts at recanalization of the subclavian vein. The salvaged portion of the AVG or AVF was able for use for dialysis the next day with flow rates of 420-450 ml/min. The patients’ HeRO Grafts have continued to function at time of publication for fourteen (14) months (AVG salvage patient) and five (5) months (AVF salvage patient). The HeRO Graft resolved one patient’s arm edema and pain due to central venous occlusive disease. Gage S, et al. Ann Vasc Surg 2011.